Made these tonight and cooked them in the airfryer at 360 for 15 minutes and flipped them in between. They were delicious. Does anyone know what this recipe is with the new point system? Thanks! All the recipes have been updated to reflect the freestyle program. Have made these twice now with gluten free bread crumbs. I also mix in a couple ounces of imitation crab meat (to stretch it a bit). Hubby and I both love these!!!! I made these for dinner tonight and they were exquisite! I am making these tonight and we are all so incredibly excited to see how they turn out. Like many people that have posted we have tried numerous recipes and can safely say that you have single handily transformed our eating habits. We are consuming way more fresh produce than ever before and my kiddos are excited about dinner time again. We can’t thank you enough for sharing all of these lovely recipes! Dinner time is once again family time, plus we are now eating fresh, nutritious food everyday – I call that a WIN! Can these be made ahead and frozen? If so, how would I go about baking them? Thanks! These look amazing! I plan to serve them as a main dish for an upcoming dinner party. What would you recommend serving this with? Really anything, but these are great over a simple salad. These crab cakes are fabulous; limited preparation yielded an outstanding meal. My husband and I made these cakes and sauce this morning (a Saturday) then refrigerated and baked tonight; our cakes developed small liquid pools around each during refrigeration – which may have been caused by the 8 oz., rather than 9 oz., lump crab container I purchased. Anyway – 11-minutes-per-side later these excellent crab cakes became dinner, with a side of steamed broccoli (that I dipped into the terrific Chipotle Lime sauce). We have already declared these crab cakes, in bite-size form, will be part of an upcoming holiday buffet. You are genius, Gina; every SkinnyTaste recipe I have tried has been excellent — and these cakes are on par with your with your other bar-set-high, healthy, recipes. Thanks so much for helping your myriad fans become, or stay, healthy. These were so good. My husband said they were better than restaurant crab cakes! I used two 6 oz cans of lump crab meat. They were very moist, and I was a little concerned about their holding together … there wasn't any problem. Thank you! Hi Gina! I was wondering if the patties can chill overnight in the fridge? Sorry, I'm actually a vegetarian (thinking of making these for a party) and just don't know how careful to be with meat and fish! I want to try these with tuna. Do you think it would work? @Gina. Would this work if I used fat free mayo or would it not have the same effect? Thanks for all of the amazing recipes–can't remember the last time I cooked a meal that wasn't from your site! One of the best crab cakes I've ever had! Had no trouble with them falling apart – I simply used a 1/2 cup measuring cup and dumped them out directly onto a parchment lined baking sheet and shaped them with the back of a spoon. I refrigerated them and put them directly in the oven – never touched them with my hands. They worked perfectly. I love these! Even made them with cooked flaked cod fish instead of crab. Great recipe. As these were sooo delicious and it left me wanting more but at $20 for only 8oz of lump crab I can't afford it. I will try it with shrimp as someone else suggested. I love this site!! Could you sub the Ritz Crackers for Panko breadcrumb? Or would it not taste as good? I dont know what it is but altho I like all your recipes, your seafood ones always blow me away! This was soo good and my friend loved it. The only change I made was I added old bay seasoning to the crabcake mix and used extra roasted red peppers for the sauce. Gina, you answered the mayo question above, but I'm hoping for a different answer:-). I'm allergic to eggs and dairy (the greek yogurt sub you suggested). Have you tried anything with vegan mayo and egg products? Think it would work? 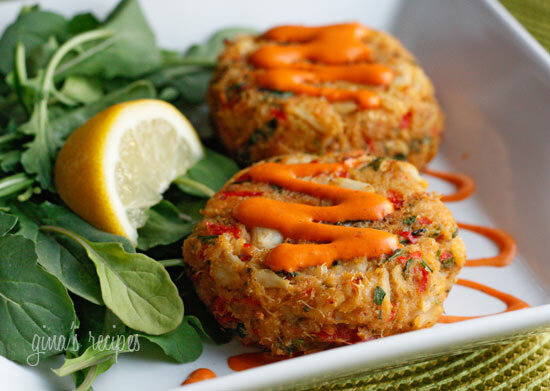 I haven't had crab cakes in so long, but I must try these! I made these for a tailgate today and they were a huge hit! I tripled the recipe and made smaller appetizer sized patties. I ended up with 45. I made them the night before and baked them in the morning. I did find that there was a little too much lime juice, so they were sitting in the juice after being refrigerated for a couple of hours. After draining the juice, they were perfect. Thanks so much – your recipes are amazing!! So I really wanted to try this recipe but husband brought home canned of crabmeat. I don't even know where he found it. Could I use it or just wait till I get back to the store and try it all another night. Thanks!!! I love your recipes, we cook very similar. I make these crab cakes at least once a month. Last night my husband requested them for fathers day:) I switched it up a little and put each crab cake on a large Portabella mushroom then baked for 20 or 25 minutes. Yum, so good! I just want to thank you for sharing this recipe. It was beyond delicious. EXTREMELY, EXTREMELY, EXTREMELY difficult to have just one serving, so make sure your willpower's set to high! I want to make these tonight. I have dried chipotle peppers and dried adobo seasoning. Do you think I could conjure up something close to the "canned chipotle chilies in adobo sauce" with that? I made these for some friends over the weekend and they were a big hit! I was shocked at how easy they were to make as well. WOW! Absolutely delicious! My whole family said "wow they taste like they came from a high end restaurant" ! Thanks for sharing! Simply …. Amazing! These are the best crab cakes I have ever eaten! Just made these tonight for dinner and they were amazing. We almost decided to skip the chipotle lime sauce, but I'm so glad we didn't. It was perfect and we also put avacado on top! I plan on trying the summer tomatoes, corn, crab and avacado salad tomorrow with the left over crab meat! Thank you so much for your recipes. My friend and I are in college and make a new recipe of yours every week! You make eating healthy so much more fun! What about panko crumbs rather than ritz? Could that work? my husband and i are trying these tonight. just put them in the oven and they already smell delicious. just wanted to say thank you for creating such amazing recipes. we definitely don't feel like we're on a "diet" but rather just eating healthy. thanks! Can yo tell me the point value and calories for the crab cakes without the sauce? Absolutely Delicious! Made these for dinner last night and the fiance didn't even realize they weren't fried. The Chipotle sauce is absolutely perfect! Scrum diddly umptions! WOW! Luckily I had enough points left to have 2 servings! Restaurant quality for sure! The sauce was spicy and a great compliment to it. Added a salad and asparagus. Thanks for this one…coconut shrimp tomorrow. You make "dieting" easy! Gina- My husband and I just finished the cakes and they were so yummy!! The only problem was that they fell apart a bit, which isn't a big deal for us, but I wondered if you had any other tips to try to get them to stick together a little better (besides putting them in the fridge)? More egg? Thanks in advance for your advice! We love your website and have really enjoyed everything we've made (at least over 10 of your recipes!). Thanks!! I feel like mayo is a must, maybe do half mayo, half Greek yogurt. I've been wanting to make these but my husband doesn't like mayo. Is there anything you can recommend as a substitution? I'm not concerned about the point value of a substitution since we are not doing WW. Just made this and it was wonderful, the sauce was so good. I just found your site and can't wait to try more recipes. Thanks! Gina, these were delicious!! I did make them without your sauce only because of the heat factor. I made a lemon vinaigrette that I usually serve with crab cakes and served them on a bed of spring mix. Goes great with Pinot Grigio! Everyone wanted more so I will have to double the recipe next time!! TY for all your delicious and healthy recipes. I'll be making the spinach and zit, sofrito chicken stew, and the angel hair with shrimp and asparagus this week too! Can't wait to try them. Wow these were great! I didn't make the sauce to go with them (couldn't track down the canned peppers), and they were awesome anyways! I think you could freeze them before baking. Then you'll have a meal for another night! Am new to your website but have tried a few recipes and they are delicious! Can I freeze these crab cakes? Since I am cooking for 2, I try to pick recipes that can be cut in half or that I can freeze half. So my $.02 is if you could, where possible, indicate what can be frozen. Thanks! Hi Gina, I can't say enough wonderful things about you and the work you have done with this website. My friend sent my a link last week and I have made about 8 recipes so far. Each better than the one before. I'm not one for spicy so I didn't even bother with the sauce. What is the points value of the crab cakes alone and the sauce alone? Thanks again! I have just started getting into cooking and need to know where to find canned chipotle chillies in adobo sauce? This recipe was amazingly delicious! I used canned crab from Costco and doubled the recipe. Hubby and I loved it and will use this sauce on everything! So glad I found your site and look forward to trying many more recipes! I made these for dinner tonight with canned lump crab meat as that is all we can get in our area right now. They were excellent! Picky spouse who is not on WW loved them too. Thanks for all the great recipes! I love your site! I made this for my husband last night, and he said it was hands down, the best thing I have ever made and definitely a repeater! Thanks so much! great recipe, can't wait to try it. i'm a little intimated by the fresh crab part.. can you explain what kind of crab, how to cook it, etc? I'm not really sure, maybe bread crumbs. Would it be good with oatmeal instead of Ritz crackers? These are SO delicious! I am usually not a big fan of crab cakes – too rich, but my family loves them. We all thought these were great. We made them very small and served as appetizers at a family gathering. They were perfect, and Mom and I loved how many we got to eat for 5 pp! Thanks Gina, I will be making these for dinner soon. These were amazing! I love crab, but usually I'm not crazy about crab cakes. My sister and I gave these a shot and were NOT let down. Delicious; I can't wait to make them again. Gina, my boyfriend and I have been cooking our way through your website and we have had SUCH great luck with all of your recipes. I made these for him on Friday night… AMAZING. You're the best! I made these for my family on mothers day.. they were amazing. Thank you! These are absolutely delicious! I made them tonight for my (pretty finicky) boyfriend and me. He loved the sauce and crab combo! I forgot the chipotle chilis in adobo sauce at the store, so I subbed chipotle powder. It still tasted pretty good. Thanks Gina!! Thanks Terri! I think that would work out fine! Delicious! My family loved these. Do you think it would be ok to make them the night before you plan to bake them for dinner? It would be great if I could do that and just have my husband put them in the oven. Thanks for sharing your fabulous recipes. I really think you should publish a book with all of them! Pan fried corn and asparagus sounds like a perfect side dish for this! Gina- I love your site! I had my parents & brother over for dinner last Saturday & my mom recently lost 30 pounds and has been a real pain at ANYTHING where food is served, making it hard to cook for the boys & her. 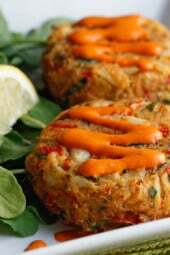 My dad is obsessed with crab cakes, so I made these – no one but mom knew they were low cal & they were a HUGE hit. I served them with some pan friend corn & asparagus with a little olive oil and minced garlic. These were amazing! I made these tonight and they were WONDERFUL! My husband and I gobbled them up. The little ones didn't love them so much but they gave them a shot. That's fine with us since it meant more for my husband and I! 🙂 I can't wait to make them again. Great recipe! It was refreshing having a crab cake where you can actually taste the crab and not just filling. The sauce is wonderful!! I made with the mussels and it was a wonderful meal!! Just found this and I would like to try it out! I've never bought crab before, and I'm a little confused – everything I'm finding (even the fresh stuff) is already cooked. Is that what I should be buying, or should I be looking for uncooked lump? Can I use whole wheat bread crumbs instead of the ritz crackers? Silly question, but can I let the cakes sit in the fridge overnight, or would they not hold well? I am trying to cut prep time for the day that I serve them. Thanks for all of your WONDERFUL recipes and willingness to help. I noticed that you didn't have the Points Plus value so I put it in my recipe builder, it looks like they're now 5 points for one. Can you just confirm this? Thanks for your comment Natasha!! Made these tonight with my fiance. Unfortunately our market was sold out of lump crab meat but we bought some pasteurized stuff in can. Expensive but tasted amazing! We also accidentally bought the peppers in oil so I just rinsed them. I've ordered crab cakes a few times and split them with my fiance, and they have NEVER been as good as these were! Seriously, filling but not overwhelmingly rich. I'm so happy you all enjoyed them! And Donna, anytime! I made these as a special treat for my husband for Valentine's Day. Delicious, especially with the sauce! I doubled the recipe, in order to have leftovers. My husband took 2 to work the next day, and when he reheated them at his office, his coworkers wanted to know where he got such wonderful food! Thanks for making them think I'm a great cook! Thanks so much for making Weight Watchers a little easier. I have loved all of your recipes that I have tried….especially the fish with the Thai coconut curry sauce….that one is Wonderful. Just finished making/eating these. These were awesome. I have made a ton of your recipes but I think this is one of the best so far. I had no problems with using canned crab; tasted great. Thanks! Tell your boyfriend he is very sweet!! Glad you liked everything you tried so far! Gina! You are the best! This recipe was so beyond delicious. You are an inspiration… My boyfriend said we need to send you a thank you gift, we have tried 7 of your dishes so far and have been amazed by all! Beautiful, inspirational blog! thanks so much! No, roasted red peppers. If you can't find them, you can make your own roasted pepper by charring the skin on a grill or stove. A little more involved. Yes, roasted peppers come in a glass jar, sometimes in oil, sometimes in water. Use the ones that come in water. Probably in the Italian section or near the olives. Thank you so much for this recipe- the crabcakes were delicious! I'm also very thankful for the tip you gave about gently folding the crab into the mixture. I've made crabcakes before and roughly combined all the ingredients. Eating chunks of crab doesn't even compare. Lovely! gina- i kinda feel dumb asking this but i was wondering if you could explain what jarred roasted peppers are or where i could get them. is that something i could get at like safeway? sorry! i'm just getting into cooking! thanks for your help! Excellent!!! Glad you liked it!! Gina – I just made these for dinner tonight and they were SCRUMPDIDDLYUMPTIOUS!! My husband and I both loved them. Thank you soo much! I love your site! I made these for dinner tonight. DELICIOUS! Thank you for the wonderful recipe. The only time consuming part was picking all the crab meat out of the shells. That took a long time LOL. Thanks. @Proud, I think it would be great with shrimp! Would you use raw shrimp or cooked shrimp in the mixture before baking? Mmmm, I'm going to try this using shrimp, that would work, don't you think? I always have some shrimp around. I love the sauce too! You could use imitation crab meat, it just won't taste as good as fresh lump crab meat. Also, I've tried this with canned crab, but I did not care for the taste. It had a metallic taste to it. Fresh is best! Could you use imitation crab meat? I LOVE crabcakes and have never made them at home. They have always been something I order out, so I cannot wait to taste these!!! Thanks again Gina!!! The chipotle sauce alone is 1 point per serving. (makes 4 servings) Serving size for sauce is 4 teaspoons. You could probably use chopped shrimp and make shrimp cakes, or cooked fish, but I'm not sure how it would taste with canned tuna. I used canned tuna and they are amazing!! Could you use canned tuna as I am not a big crab fan? If so what would the points be? Thanks for noticing, the first batch had yogurt but I didn't care for it with yogurt so I remade it. I'll adjust that! I’m going to try with half mayo, half yogurt. Did you use yogurt or light mayo in the sauce? The directions say yogurt but the ingredients say mayo?